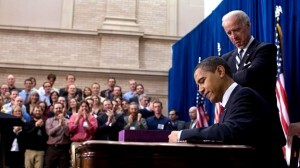 President Barack Obama signs the Stimulus Bill into law on February 17, 2009 in Denver, Colorado. Just a day after U.S. Rep. Allen West, R-Fla., called for Attorney General Eric Holder’s removal, alleging a White House connection to the “Project Gunrunner” that allowed weapons to be delivered to Mexican drug lords, confirmation has come that the program originated at the highest levels of the Obama administration. As we contended in our article of June 15, 2011, U.S. Attorney General Eric Holder Sends Arms to Mexican Drug Cartels; the buck did not stop with the Bureau of Alcohol, Tobacco & Firearms (ATF), but that U.S. Attorney General Eric Holder was involved, as well. Now the buck moves one step up—to President Obama, who signed the bill authorizing gunrunning into law. “Project Gunrunner” which supplied arms to the Mexican drug cartels was named and authorized in Obama’s 2009 $787 billion American Reinvestment and Recovery Act, commonly known as the Stimulus Bill. Section 5, Division A, Title II, under the heading of “Office of Justice Programs,” says the money is set aside for border regions. For an additional amount for ‘State and Local Law Enforcement Assistance,’ $40,000,000, to remain available until September 30, 2014, for competitive grants to provide assistance and equipment to local law enforcement along the Southern border and in High-Intensity Drug Trafficking Areas to combat criminal narcotics activity stemming from the Southern border, of which $10,000,000 shall be transferred to ‘Bureau of Alcohol, Tobacco, Firearms and Explosives, Salaries and Expenses’ for the ATF Project Gunrunner. The Stimulus Bill was enacted by the 111th United States Congress in February 2009. No Republicans in the House and only three Republican Senators voted for the bill. However, Republican Senators Olympia Snowe (ME), Susan Collins (ME) and Arlen Specter (PA) did vote for the bill (and for sending guns to Mexico). In the House, Nancy Pelosi, cast her vote for the bill to send guns to Mexico, and brought the entire Democratic House with her, with the exception of 11 courageous dissenters. 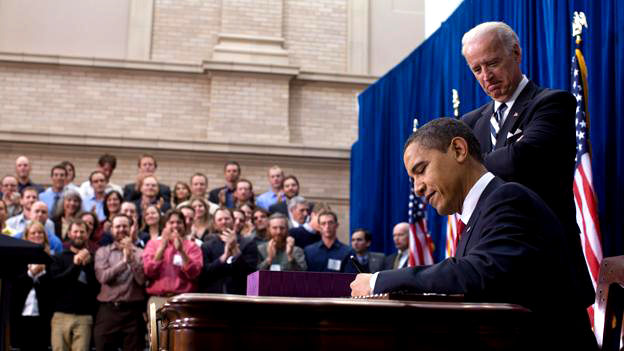 The Stimulus Bill was then signed into law on February 17, 2009 by President Barack Obama at an economic forum he was hosting in Denver, Colorado. Sen. Chuck Grassley, R-Iowa, said he would support the call for a special prosecutor if members of Congress investigating the issue of running guns into Mexico believe that is the best solution. It is doubtful, however, that anything will come of Sen. Grassley’s suggestion—Obama, Holder, and the Drug Cartels are too powerful. According to the San Francisco Chronicle, FBI informants were connected to the ATF’s Project Gunrunner. These FBI informants are known criminals who used American taxpayer dollars to move guns into Mexico. Jesus Rejon Aguilar, nicknamed El Mamito or “Pretty Boy,” a co-founder of the Zetas drug cartel,was captured last Monday by Mexican authorities. El Mamito has said that he was buying guns directly from the U. S. federal government. In fact, El Mamito, a Mexican army deserter, was wanted in the slaying of U.S. Federal agent Jaime Zapata with one of Eric Holder’s guns. In just the last 24 hours, battles between the El Mamito’s Zetas gang and other drug cartels led to the discovery of more than 40 bodies in Mexico, a government official said today. 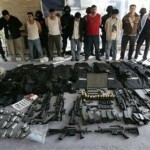 Should we expect that Obama, Holder, or any American officials will suffer from their decision to send guns to Mexico? They certainly should, but we doubt it. Our condolences go to the family and friends of U.S. Federal Agent Jaime Zapata, just one of the many innocent present and future victims of Project Gunrunner. Apparently, the FBI concealed evidence to protect a confidential informant–that FBI informant works inside a major Mexican cartel and provided the money to obtain the weapons used to kill Terry. The two AK-type assault rifles were purchased by Jaime Avila from the Lone Wolf Trading Co. outside of Phoenix on Jan. 16, 2010. Avila was recruited by his roommate Uriel Patino. Patino, according to sources, received $70,000 in “seed money” from the FBI informant late in 2009 to buy guns for the cartel. According to a memo from Assistant U.S. Attorney Emory Hurley, who oversaw the operation, Avila began purchasing firearms in November 2009, shortly after Patino, who ultimately purchased more than 600 guns and became the largest buyer of guns in Operation Fast and Furious. On September 9, 2011, the Congressional investigation into ATF’s Fast and Furious scandal officially expanded to include White House staffers. In a letter to President Obama’s National Security Advisor Thomas Donilon, Rep. Darrell Issa (R-CA) and Sen. Charles Grassley (R-Iowa) asked for records involving three current and former White House staffers. 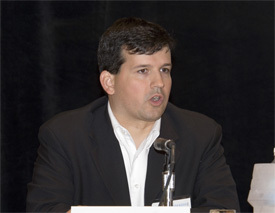 The staffers are: Kevin O’Reilly, former Director of North American Affairs, National Security Council; Dan Restrepo, Special Assistant to the President, National Security Council; and Greg Gatjanis, Director for Terrorist Finance and Counternarcotics, Counterterrorism Policy, National Security Council. Eric Holder lies to congress. Oct. 2011 update. The Fast and Furious scandal just keeps escalating. The latest development is whether or not Attorney General Eric Holder lied to Congress about having knowledge of the gun trafficking operation. Recently released documents say Holder was briefed about the operation long before he told the Judiciary Committee he was first aware of what was going on in 2011. Yet internal Justice Department documents show that at least ten months before that hearing, Holder began receiving frequent memos discussing Fast and Furious. House Judiciary Committee Chairman Lamar Smith, R-Texas, sent a letter to President Obama requesting the president instruct the Department of Justice to appoint a special counsel. Holder claimed he was not familiar with the Bureau of Alcohol, Tobacco, Firearms and Explosives program known as Fast and Furious until about April 2011. On May 3, 2011, Rep. Darrell Issa, R-Calif. asked Holder when he first knew about the Fast and Furious program. Holder replied: “I’m not sure of the exact date, but I probably heard about Fast and Furious for the first time over the last few weeks.” That contradicts Holder’s prior testamony. Other documents also indicate that Holder began receiving weekly briefings on the program from the National Drug Intelligence Center beginning, at the latest, on July 5, 2010. The House Committee on Oversight and Government Reform released a video asking who should held accountable for “Fast and Furious,” a scandalous Department of Justice operation that purposefully put assault weapons into the hands of Mexican drug lords and is now blamed for killing hundreds of people, including U.S. border agents. The video takes hard aim at U.S. Attorney General Eric Holder, who on May 3, 2011, swore testimony before the committee’s chairman, Rep. Darrell Issa, R-Calif., that he had only heard of the operation “weeks” before. Yet Issa and fellow watchdog Sen. Chuck Grassley, R-Iowa, say they have a series of at least five weekly briefing memos from Michael Walther, director of the National Drug Intelligence Center, detailing the program to Holder and dating back to July 2010, long before the “weeks” in Holder’s testimony. Money. What other explanation can there be than Holder is working for a Mexican drug cartel? The murder of a U.S. Border Patrol agent is related to a Justice Department willingly turning over thousands of guns to Mexican criminal gangs, and Obama administration is hiding information about his death from the public. Amazing. This week marked some huge developments in the “Fast and Furious” scandal that involved the Obama administration’s allowing guns to “walk” across the border into the hands of Mexican drug cartels directly resulting in the death of U.S. Border Patrol Agent Brian Terry. At least 150 Mexicans were murdered by Fast and Furious guns. There are signs at every border crossing stating that the importation of guns and ammunition are illegal. Not only are Obama and Holder violating Mexico’s sovereignty, but they are breaking the law on both sides of the border. On Wednesday, Attorney General Eric Holder was voted in contempt of Congress by the House Committee on Oversight and Government Reform, led by Rep. Darrel Issa (R-CA). The contempt relates to Holder’s refusal to turn over key documents about the Fast and Furious operation. Next week, assuming the full House votes as planned, Eric Holder is likely to find himself to be the first Attorney General of the United States in history to be found in contempt of Congress. In an effort to derail the contempt vote, Holder asked the president on Tuesday to do what Obama does best, use the power of the Oval Office to try to shield documents from disclosure. Obama complied asserting executive privilege, possible incriminating himself. The scandalous assertion of executive privilege necessarily draws President Obama into this scandal about the murder of a federal law enforcement agent and the sending of arms by Obama and Holder to Mexico’s most powerful cartel – the Sinaloa cartel. On the Mexican side of the border a major development in the Fast and Furious scandal has just taken place. A man suspected to be Jesus Alfredo Guzman was arrested in Mexico on Thursday, June 22nd morning, according to the Mexican officials. He was suspected of being the son of Joaquin Guzman, a Fortune 500 billionaire, runs the Sinaloa cartel, Mexico’s most powerful cartel. The Sinaloa cartel is the major beneficiary of the Fast and Furious gun-running operation. Mexico’s government has now admitted that it mistakenly identified a detained man as the son of Joaquin Guzman. On Thursday officials paraded before the media a man they said was Jesus Alfredo Guzman, whose father leads the powerful Sinaloa cartel. But the arrested man was in fact Felix Beltran Leon, a car salesman, the attorney general’s office said. The authorities had hailed the arrest as the most important in years, but they were wrong. Guzman’s Sinaloa cartel controls much of the flow of cocaine, marijuana and methamphetamine to the United States. The U.S. Treasury said last month Americans were banned from doing any business with two of Guzman’s sons, who were identified as Ivan Guzman and Ovidio Guzman, under the terms of the Foreign Narcotics Kingpin Designation Act. One has to question the motives of Obama and Holder in their actions. Are they in it for the money? The Republican-led House of Representatives on Thursday voted to hold Attorney General Eric H. Holder Jr. in contempt for failing to disclose internal Justice Department documents in response to a subpoena. It was the first time in American history that Congress has imposed the sanction on a sitting member of a president’s cabinet. The dispute centered on whether the Justice Department must turn over information showing its internal deliberations about Operation Fast and Furious which was smuggling arms and ammunition into Mexico for the Mexican drug cartels. President Obama had invoked executive privilege to protect the guilty in the operation. The vote in Congress was an overwhelming 255 to 67 against Holder on criminal contempt, and 258-95 to pursue a case against him in the courts. Scores of Democrats, calling the vote a witch hunt, walked out of the chamber in protest and cast no votes. These Democrats cared only about the politics involved. They ignored the fact that Holder’s operation, Fast and Furious, was breaking the law both in the U.S. and Mexico. Moreover Holder’s operation led to the death of two American border patrol agents–killed by Holder’s guns. Still the citations are a stain on Holder’s record. House minority leader, Nancy Pelosi of California, called the vote against Holder a “heinous act” and an “unprincipled” effort on the part the 255 members of Congress who voted against Holder. This was Pelosi’s attempt to divert attention away from the fact that under Holder’s watch crimes had been committed. In defiance of Pelosi, four Democrats – and all Republicans – voted for a separate resolution authorizing a lawsuit that would ask a judge to order the Justice Department to comply with its subpoena, setting up a test of Mr. Obama’s assertion of a form of executive privilege that protects agency deliberations from disclosure. The latest available polling, from late April, showed his unfavorable rating at 47 percent — and just 17 percent of people reported having positive feelings about the attorney general. Holder, however, has nothing to fear. The legal process against Holder will not wind its way through the courts until long after Mr. Holder’s forced departure at the end of this year. Should the legal process result in a conviction against Holder, Obama, if he is still around, can pardon Holder just as Bush pardoned Scooter Libby.